The website provides visitors with current up-to-date news and sustainability initiatives from the corrugated packaging manufacturing group of companies. Furthermore, visitors can obtain necessary product information and specifications, request quotes, and learn of sectors served and registered patents. Interstate Container is the founder of the recyclable, reusable, and compostable GREENCOAT® wax-alternative corrugated boxes for poultry, meat, seafood, and floral and landscaping packaging. Interstate Container member companies include: Interstate Container Cambridge LLC in Maryland, Interstate Container Westminster LLC and Interstate Container Lowell LLC in Massachusetts, Interstate Container Brunswick LLC in New Jersey, Carolina Graphics Services LLC and Southcorr Packaging LLC in North Carolina, Interstate Container Reading LLC in Pennsylvania, PSI Packaging Services LLC in Tennessee. 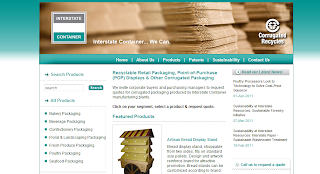 Interstate Container is a division of Interstate Resources Inc., a member of INDEVCO Group. Labels: Interstate Container, Interstate Resources Inc.